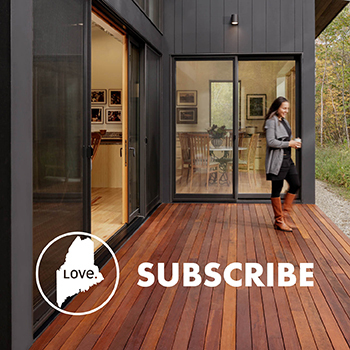 For the landscaping, Robbi Woodburn of Woodburn and Company Landscape Architecture designed a sharp divide between a “civilized landscape,” as she puts it, and the surrounding woods. Mike Corsie of Terrapin Landscapes also contributed to the landscape design, including “the most beautiful installation of blueberry sod I’ve ever seen,” says Woodburn. A stone wall, built by mason Raymond Dussault with natural stone from Genest, helps to define the property. 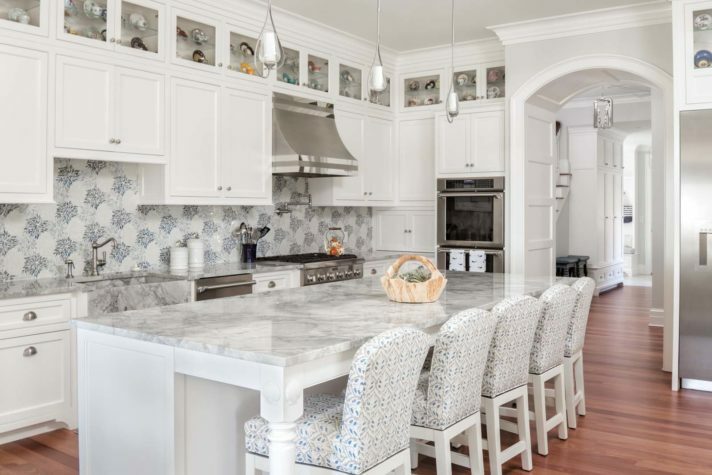 Cabinetry is extensive throughout a Kennebunk house designed by William Ross Design, built by Thomas and Lord, and decorated by Jean Edwards Interiors. The glass cabinets hold a collection of teacups and saucers that homeowner Mary Mills inherited from her mother. Michael Pouliotte of Traditional Wood Works is responsible for the cabinetry as well as the pocket doors, exterior detailing, and built-ins. The owners’ bedroom has a second-floor bowed balcony that overlooks the Atlantic. The chaise lounges are from Lane Venture. 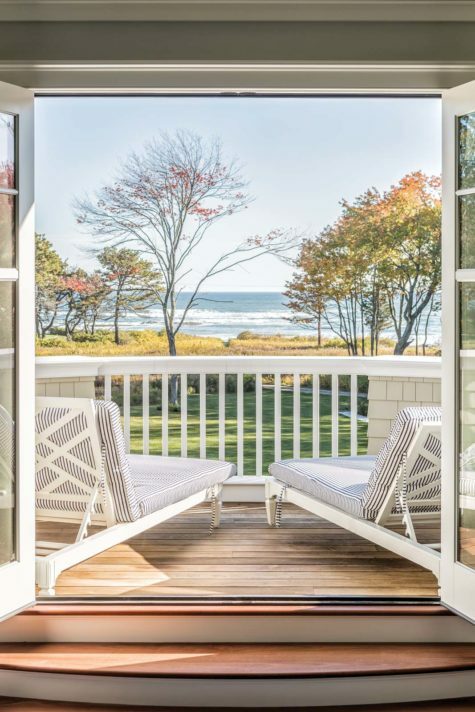 The ocean side of the house has ample fenestration, a complicated roofline, and a circular porch. This house is controlled by a Savant automation system installed by SmartHome Solutions, which allows the lights, music, televisions, security, and HVAC to all be controlled anywhere by an app. On the porch, SmartHome Solutions also installed a custom drop-down TV lift that allows the Millses to watch their favorite shows outdoors. When they’re done, the television retracts back into the ceiling to keep it out of the elements. The owners’ bedroom continues the navy palette from the ground floor, as well as the inclination to use multiple patterns in the same space. As in other rooms, delicate patterns (as seen on the bed) are combined with patterns drawn from the natural world such as the flowers on the chair fabric. The house has three propane fireplaces. This one is based on a fireplace that homeowner John Mills saw in Colorado. 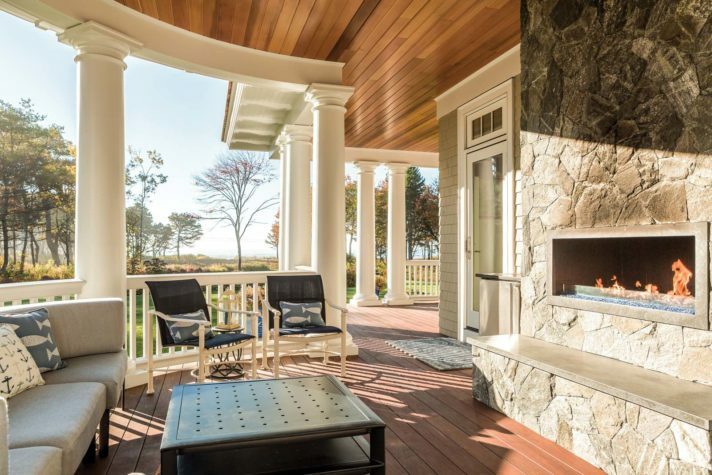 The entry hall extends from the front of the house to the back, where a door leads to a porch and the ocean beyond. 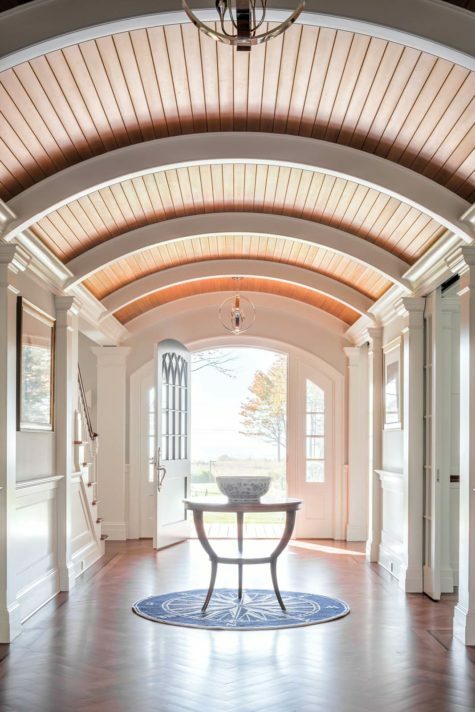 The barrel-vaulted ceiling is made of sycamore, and the floor is a Santos mahogany laid in a herringbone pattern with a strip of wenge. The pocket French doors to the right lead to the dining room. The Hudson Valley Lighting chandeliers are from the Lighthouse. 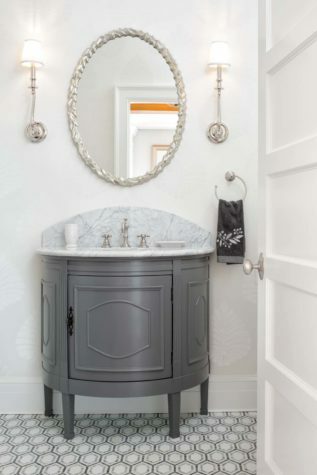 The powder room vanity is actually a chest that Mary Mills bought from Wayfair, which she had painted and to which Kevin Lord added a marble top and sink. The bathroom off the boys’ bedroom has a trough sink, the underside of which was painted blue. The trio of faucets and step stools are designed for the Millses’ three grandsons. 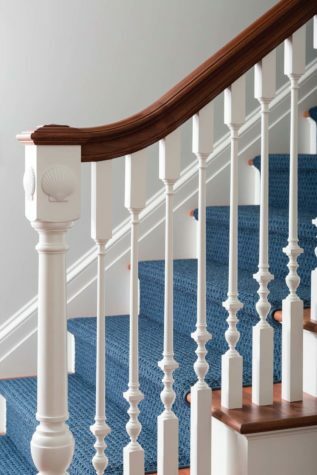 The central staircase has shell detailing on the newel. A chest of drawers from Antiques on Nine. The “hers” bathroom in the owners’ suite has uplighting in the cove moulding as well as a chandelier. 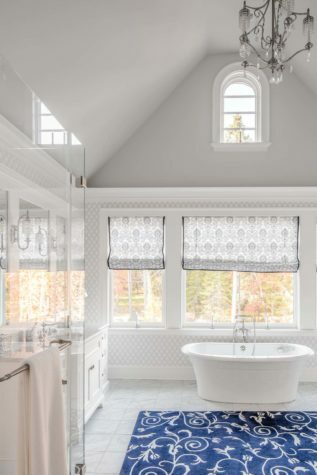 The wallpaper, Roman shades, and custom rug mix patterns but manage to still feel connected by their blue palette. 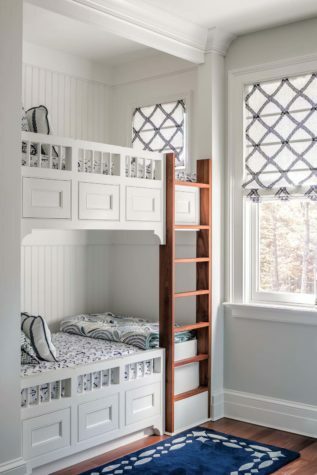 The boys’ bedroom has four bunks, a built-in ladder, beadboard walls, and linens with an anchor motif. 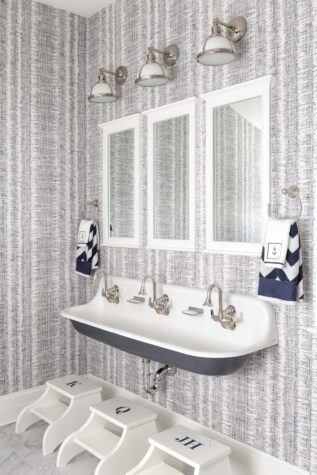 Playing with pattern in a guest bathroom. 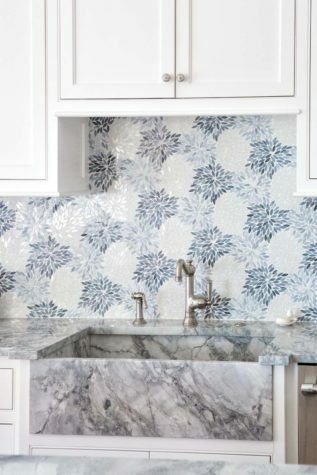 The kitchen backsplash from Blue Rock of Maine with a modern floral motif. 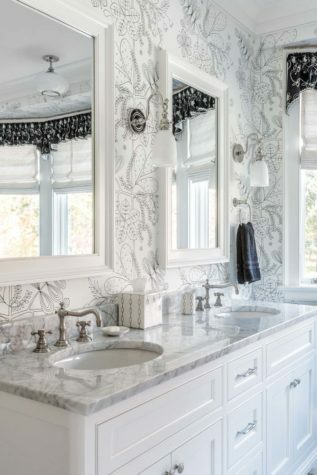 Working with interior designer Jean Edwards, Mary Mills often started with “two or three fabrics I absolutely loved,” she says. A favorite included the embroidered wildflowers fabric from Colefax and Fowler, used on the slightly curved sofas from Century Furniture. Edwards reined Mills in on the occasion she thought the fabrics were getting too wild. Mills says, “She let me do what I wanted and then very sweetly told me, ‘No. That is not going to look good.’” The fan detailing above the fireplace is repeated over the front entry. The formal dining room (opposite, top) has a wood-topped table that was finished with car paint applied in a chevron pattern. A trophy room with sports memorabilia includes an eclectic collection of hockey pucks, baseballs, baseball cards, and signed photographs from sports and political figures, including one from Mickey Mantle. (“He was my hero,” says John Mills.) A pickax from Edmund Hilary, the first English climber to ascend Mount Kilimanjaro, is stored with baseball bats on the left. A Kennebunk shingle style for twenty-first-century grandparents. John and Mary Mills seem as much comedy team as retirees as they talk about their new home in Kennebunk. The story starts with a run. “In the summertime, I am a jogger, not a runner,” John says. “I slog along.” On one such jaunt, on a lovely late August day three years ago, John decided to go farther than usual and run down Parsons Beach Road. If the lane had “No Trespassing” signs, he missed them. He ran past a horse farm and on to an “unbelievably beautiful” stretch of oceanfront with wide views up and down the coast. Oddly, when he returned from what had become an eight-mile run, he found a postcard in his mailbox advertising the very acreage that had so wowed him. John wanted to call the broker, even though he felt he “needed another piece of land like a hole in the head.” At the time, he and Mary were based in New Jersey but owned three homes in the Kennebunks. “And I had never sold a home. Never,” says Mary, making it sound less like a financial transaction than auctioning off a baby: unforgivable. 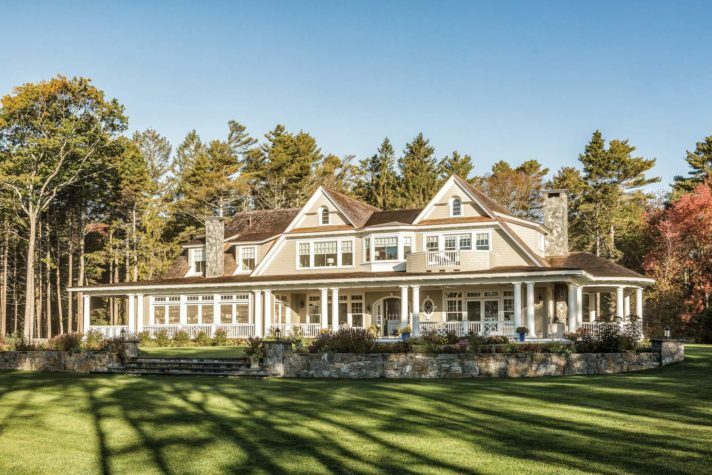 That said, Mary and John did eventually sell one of their Maine homes and were left with two contiguous homes, including a six-bedroom house that once belonged to Edmund S. Muskie, the former U.S. secretary of state. John calls it “the world’s most expensive guesthouse.” Still, the Parsons Beach land seemed like an opportunity. Eventually, they reasoned, they could rent or sell what they still had. 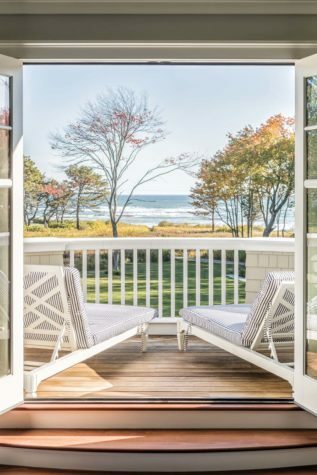 The grand sweep of land on Parsons Beach seemed to require an equally grand approach to design, and from the start, Mary says, she knew what she wanted: a sizeable turn- of-the-century–style “cottage,” with William Ross of William Ross Design in York Harbor as architectural designer and Kevin Lord of Thomas and Lord in Kennebunkport as builder. 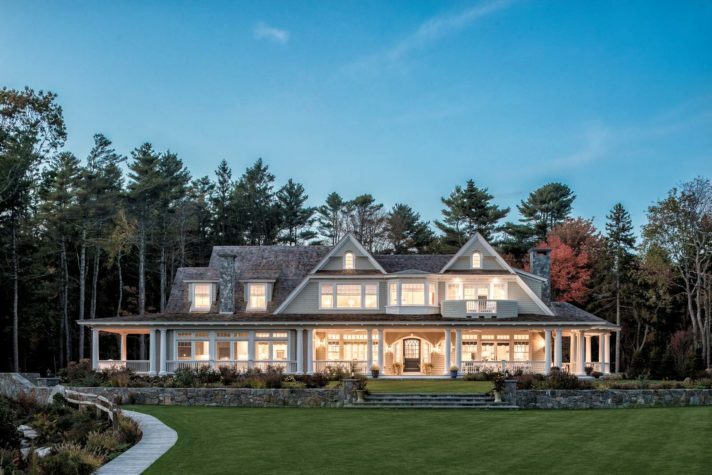 The result is a classic shingle-style with a long back porch; complex, gabled roofline; ample fenestration; white-cedar shingles for the siding; red-cedar shingles for the roof; and embellishments such as a bowed balcony and oval window. The couple wanted the interior open, but not open-concept. One can see from room to room on the ground floor, but the spaces are clearly defined, and some can be closed off with pocket French doors. Old World splendor meets New World luxury in the interior, where downstairs ceilings are almost 11 feet high, and the rooms are designed to be comfortable and welcoming. 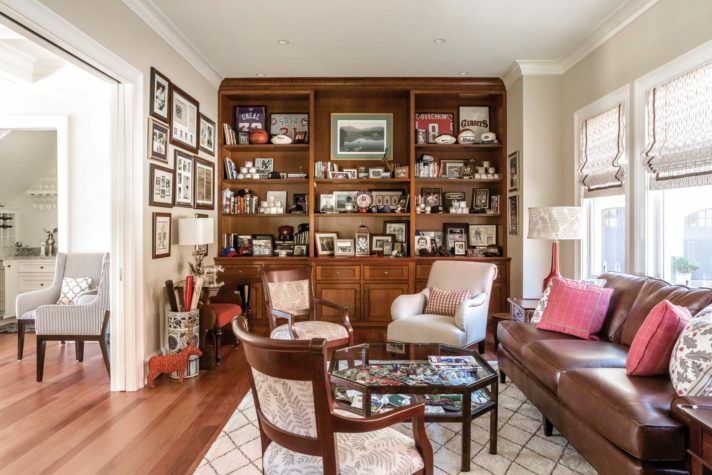 A sports memorabilia room with a leather sofa and wingback chairs displays John’s collections of baseballs, baseball cards, and autographed photos, as well as a three-dimensional Clue board encased in walnut veneer, the rooms of which have parallels in the Millses’ house. There’s no ballroom—unless you count the large, flat lawn outside, which is set up to accommodate tents for dancing events like an upcoming wedding—and no conservatory, though the many planted beds provide plenty of flowers and greenery. Other familiar Clue rooms are represented, however. The sizeable kitchen features polished granite countertops. (“Neither of us is a great cook,” Mary admits. “I cater well, though.”) Running from the front to back door, the dramatic front hall has a barrel-vaulted ceiling of sycamore and a Santos mahogany floor laid in a herringbone pattern with a framing strip of wenge. Off the kitchen, a cherry-lined study has a fireplace, built-in window seat, his-and-hers mahogany-topped desks, and floor-to-ceiling bookcases. A second study for guests, with more cherry bookcases, is on the large landing at the top of the central staircase. Down a hall, a second landing with casual upholstered furniture serves as a lounge, or quiet area, for the Millses’ five grandchildren. The “billiards room” takes the form of two spaces: a basement playroom with ping-pong and shuffleboard tables and an upstairs playroom (located above the garage) with four pinball machines, tables for art projects, and two toddler-sized closets, a.k.a. hiding spaces. A room that Hasbro might want to consider adding to the Clue board? A three-season sitting porch. The Millses have a round one with a fireplace, a flat-screen TV that descends from the western red cedar ceiling, ipê decking, and infrared heaters. With blue sailcloth hung between the round porch columns, the space is usable in all seasons save winter. 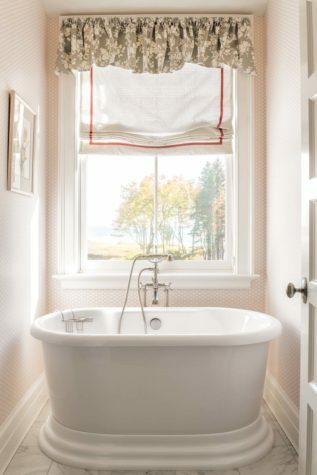 The architectural millwork—trim, mouldings, and cabinetry—is extensive throughout the house. Lord estimates that the house has 300 cabinets or drawers, some with specialized functions, as with the pull- out rack by the living room’s bar that holds candy boxes for the kids, and the laundry room cabinet whose doors open onto pull-out sweater-drying racks. Other cabinets and shelves are for display and geared to the couple’s specific collections and tastes, such as the dining room’s glass-front cabinetry for dishes, and the plate-rail cabinetry on which sit assorted teacups and saucers that Mary inherited from her mother. An upstairs corridor feels almost museum-like with its eight glass-front cabinets that are lit from within to display an extensive seventeenth- and nineteenth-century silver collection, including sewing needle cases, pill boxes, snuff boxes, dog whistles, christening cups, belt buckles, and more. 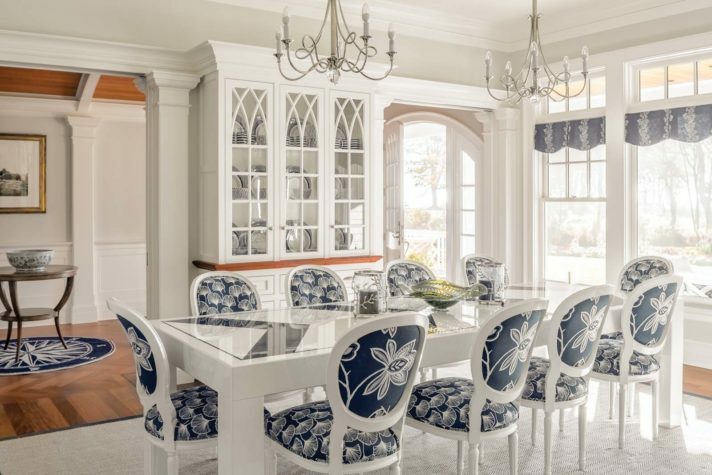 Mary collaborated with Jean Ustorf of Jean Edwards Interiors in Ho-Ho-Kus, New Jersey, on the interior design, which reflects Mary’s fondness for blue and white, desire to layer pattern on pattern, and interest in forms drawn from the natural world. 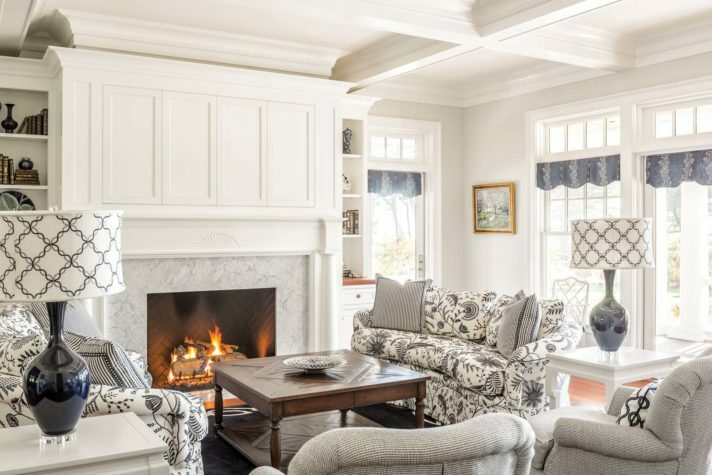 All of these affections are on display in the living room, which has sofas covered in embroidered wildflower fabric and accessorized with striped pillows, a navy rug with a white border, and cerulean window valances with a sequin pattern that suggests branches. Lamps have patterned shades on unusual bases: one base is made of stacked glazed porcelain turtles; another is in the shape of a goose. 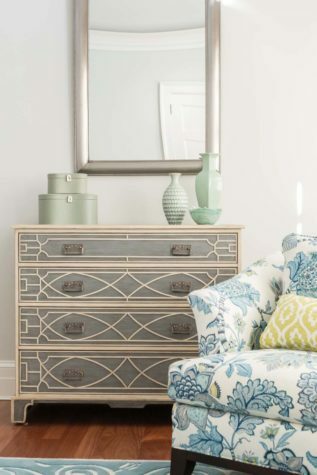 “When you layer patterns and textures, you give the room more depth and make it more sophisticated,” Ustorf says. Given that the Millses are very much focused on their grandchildren, two of the bedrooms are devoted to them. 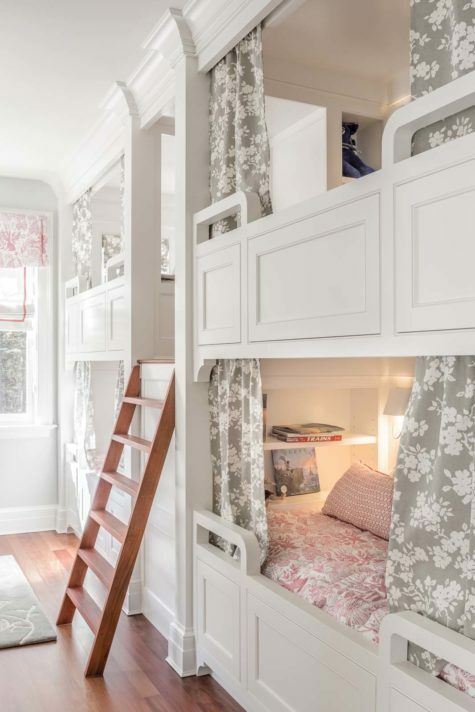 One is for boys, the other for girls, and each has four bunks outfitted with shelves, lights, and curtains. The girls’ room has dolls and pink linens, chairs, and window treatments. For the boys’ room, the theme is navy and nautical, with anchors patterning the sheets. The girls’ room has steps that go to a small landing for the upper bunks, and the boys’ has a ladder, which is “purposely fixed,” says Mary, “so they can’t hit each other over the heads with it.” Even “non-children” spaces are designed to take a beating, such as the formal dining room, with its wood-topped table finished with car paint applied in a chevron pattern. “Turtle Wax works wonders!” says Mary. In the end, the house feels like it is about enthusiasms— for friends who might be entertained, for grandchildren who might be lovingly spoiled, for curious objects that might be shared, and for craftsmanship that might be appreciated. And if a house can’t turn around and admire its occupants, its builders and designers certainly can. “Mary and John are some of the nicest, most lovely people you’d ever want to meet,” says Ross, echoing words from Ustorf and Lord. The mutual affection is personal, of course, but also reflects the chance the project gave everyone to create something unusual: a house inspired by the early twentieth century but full of twenty-first-century pleasures.